March has arrived with the promise of warmer weather and spring blooms (those are things we can all rejoice about). With a hint of newness in the air, it is a wonderful time for new growth in the real estate industry, with good options for both buyers and sellers across the country. That also makes it an ideal time for consumers and industry pros alike to catch up on some of the best Google Plus real estate articles produced by real estate professionals this month. This series was started by Bill Gassett and has blossomed into a monthly installment with the intent of putting good content in front of real estate consumers. Honestly, it was tough narrowing down the choices this month as there was so much quality content to choose from. Consider this month’s list an RE buffet with a little bit of everything to whet your appetite and leave you feeling full. The March Google+ real estate 2015 round-up is below with a variety of information on a host of real estate topics to pique your interest. Jenna Thuening is a Realtor® in Eden Prairie, Minnesota. In this excellent article she offers tips to help sellers de-clutter their home, create storage spaces that maximize potential, and also assist homeowners with getting better organized. As she cleverly points out, “You can reuse your favorite things, save money and add personal style to unique storage solutions that make life organized and easier“. I think we all want that! This is a must read for anyone who is getting ready to put their home on the market, needs to generate more storage space, or just wants to get a better handle on their home organization options! From nooks to cabinets to garages, these practical storage space tips will help put your home in its best light! This practical list by the folks at North Coast Financial in San Diego, California, provides a blueprint for real estate investors who want fast cash to fund their RE deals. With the potential for increased profits and more closed deals, this guide to hard money loans provides 11 reasons why this is a good option for investors in today’s markets. Like all investment opportunities, those seeking loans need to understand exactly what is expected, what the terms and conditions are, and have a clear road map to help them reach their financial security destination. Balancing risk vs. reward can pay off well if you understand how to utilize hard money loans to build your investment portfolio. This is foreign to those of us who call the south our home, so of course I was intrigued when I saw that Bill Gassett, a top Metrowest Massachusetts Realtor®, had posted his guide on how to fix ice dams. If you have to deal with ice dams each winter or just have a thirst for knowledge, this article takes you through the entire process from the first snowflake all the way to making a claim. No one wants to deal with weather related home damage so a little prevention and snow removal (if necessary) will go a long way to keeping your home looking its best and keeping you warm and dry. If you heed Bill’s advice and “…do your best to remove any existing ice dams, and prevent the future accumulation of ice for the long term“, you will make it through the winter unscathed and be ready for what the spring season brings! Tax season is here and the last thing any of us want is to give Uncle Sam our hard earned funds. Thankfully there are still a few ways we can best the tax man and see our investment grow! Seth Williams who is a commercial real estate banker and part-time real estate investor, shows us how to use a Self-Directed Roth IRA to invest in real estate to do just that. Seth clearly lays out the process and provides outstanding examples to help clarify and simplify how using a Self-Directed Roth IRA can be a good financial move. Having transparency, he also discusses a few of the potential pitfalls with this investment approach. If you have aspirations of retiring with enough funds to live how you like, want to be able to pay for your kids to go to college, or maybe just want some extra cash for toys or travel options, this article is a must read! San Francisco area based Move, Inc., senior editor and writer Cicely Wedgeworth holds nothing back as she outlines several luxury home features buyers will not use. Her assessment that “You’re likely to find that some of your longed-for luxuries will simply gather dust—and worse, taking up space” is spot on. Although I thoroughly agreed with her review, the diva in me was secretly wishing I had many of those cool options in my own home. She also opens up the checkbook and lists several luxury things those with the funds to afford should not go without. If I had a money tree I could easily see my home with heated floors throughout and a ready-for-TV pool oasis. OK, perhaps having a candy wall is taking things to the extreme, but it does beg the question…What creative things would your home have if funds were not an issue? Purchasing a property without having a home inspection is one of the most dangerous things a buyer can do. With so much at stake, and for literally pennies on the dollar compared to the price of the home, getting a home inspection should be a top priority for all buyers! In his why you need a home inspection article, Kyle Hiscock who is a Rochester, New York, area Realtor® provides 9 reasons why it makes perfect sense to have a home inspection by a professional inspector. Whether you are buying your first house, next property, or making your last home purchase, it is advisable to get your future home checked out by a qualified source before you close on the property. The last thing you want after closing is to deal with mold, termite/rodent infestation, electrical/plumbing/roofing issues, or even structural concerns. I know I want peace of mind the house I am about to make my home is safe, secure, and is not a money pit. I imagine you want exactly the same thing so get a home inspection and rest easy in the home of your dreams! Lisa Ross is a writer at Tour Wizard who outlines a host of things sellers should avoid doing when prepping their home to sell. The last thing you want to do is turn off potential buyers. Whether it is lack of attention to detail outside the home or avoidable mistakes inside the property, following her advice will put your abode in its best light to be seen and sold. It is not rocket science. As Lisa points out, paying attention to detail and ensuring your home appeals to the masses, are great ways to increase your selling opportunities. The bottom line for sellers is a quick sale for the highest price possible. Avoid these home tour mistakes and you may end up getting both! Personally, I do not know many people who enjoy the physical act of moving house. Add pets to the equation and the process can become quite overwhelming. In my post on tips for moving with pets I outline several things that homeowners can do to make the experience a healthy, relaxed, and safe journey for both them and their furry friends. As a retired military spouse, and Warner Robins real estate agent, I have relocated several times with pets (including moves abroad), and know first-hand what it takes to keep pets from getting too stressed out during a move. By following the 8 simple steps outlined in this article, the impact on your pets routine will be minimized and their anxiety will stay at acceptable levels. When your pets are taken care of you can fully concentrate on the other moving tasks that require your undivided attention. In this well thought out real estate piece, Russian River Valley real estate agent David R. Millar identifies several things you should never say to buyers. Whether you are a new agent or a seasoned veteran, you can bet saying any of these whoppers to potential buyers can kill a relationship and a deal. It is never a good idea say things that could be construed as offensive or disrespectful to our clients…Never! As agents, we need to guide, facilitate, and help buyers find the right home for their needs. It is that simple. When that circle-of-trust is broken, you can bet those buyers will disappear quickly never to be heard from again. As David points out, “let the buyer reach this conclusion on their own, so that they feel like it was their decision, instead of feeling like their agent is bullying or manipulating them“. Anyone can sell a home but it takes a good agent to earn trust and turn a buyer into a lifetime client. I am always on the lookout for online tutorials, handouts, or easy to follow instructions that help real estate consumers either make informed decisions or provide guidance to help them along their RE journey. In his fantastic buyer mortgage timeline guide, Tallahassee, Florida, real estate expert Joe Manausa clearly details the wait period buyers who have experienced bankruptcies, foreclosures, or short-sales must sit through before applying for home loans. Joe covers all the bases, highlighting the wait times for Fannie Mae, Freddie Mac, FHA, USDA, VA, and even Jumbo loans. While it is understood the guidelines can change, this timely post is a good tool to assist consumers who have made it through their struggles and are ready to realize the American Dream once again. See previous installments of the best Google+ Real Estate articles below for some terrific reading. 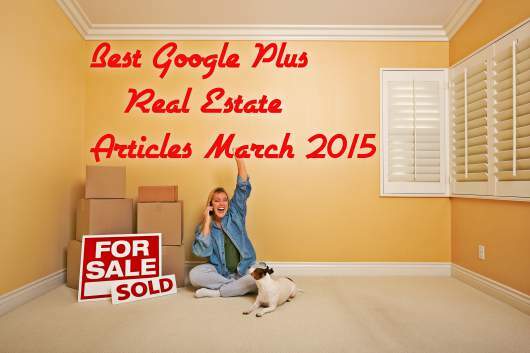 This March 2015 roundup of top Google Plus real estate articles was assembled by Anita Clark. She is a Realtor® with Coldwell Banker SSK who enjoys helping consumers satisfy their real estate needs in Warner Robins GA! Great list of blog posts! I’m definitely going to have to read these sometime. Thanks Tyler! If it was up to me I would have featured your latest real estate marketing post which was top notch! What a great list you put together Anita! It sure was a lot of fun putting this list together. There were so many great choices and I hated leaving any out! Thanks for the opportunity, Bill. You did a fantastic job Anita!